GOD ! Help them please ! I don’t know what I should write about the below picture . It turned me to a gloomy mood . It is so regretful , deplorable , reprehensible , shameful and considerable first for everyone who calls himself / herself human and second for the government of China which is oblivious neglectful of it’s people . 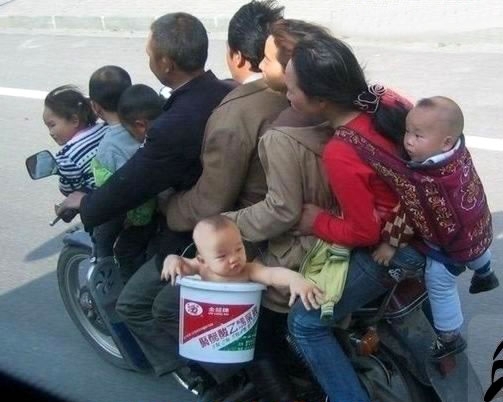 In this picture we can see a large family mounted on motorcycle and the worst part of this sorrowful story of life is the children who don’t have any right to protest ; in fact they are innocent ; they have trusted in their parents ; they think the life must be like this ; who knows maybe they are enjoying commuting by motorbike ! Some people ride luxurious cars , some have only a motorcycle and some even don’t have it. It is incumbent upon us to help them . ( It is everyone’s right to has a desirable life ) . I don’t know how many pillions can ride a rickety moto !!! Whose responsibility is to admonish them and more important to provide them an acceptable living condition . Please take strong notice to the hand of a baby who wants to catch his mother’s hand . He is so scared ! 😦 . GOD ! Help them please ! Oh … . My GOD … . The naked baby inside the buckle ( ! ) will change the future ?!?! I am confident he will do . Just wait . World’s children ! Don’t be dismal ! We help you !